The most startling finding to come out of a recent survey on Kitsap Transit’s plans for cross-Sound passenger ferry service is that most Kitsap people know nothing about it. A close second is that I’ve been wasting my time the past 10 years. There’s no topic I’ve written more about than passenger-only ferries. Hundreds of stories. But in a May public opinion poll of a statistically valid 400 people, 56 percent said they hadn’t heard of it. If anything, I figured people were sick of reading about it. Maybe it’s because the business plan for fast ferries running from Bremerton, Kingston and Southworth to Seattle is relatively new. It was published in December 2014. People have been busy. Leading up to the report, however, was an 8 1/2-year, $12.7 million research project that culminated in building and testing a high-tech catamaran that can transit Rich Passage without tearing up beaches. Sixty-one percent of survey respondents weren’t aware of the research. Executive Director John Clauson seemed astonished. Poll results were surprisingly positive in many regards. Though 56 percent said they didn’t know about the plan, 72 percent were interested in pursuing the service. Three out of four thought it would be good for the economy. Under the plan, 30-minute sailings would cost about $1.50 more each way than existing walk-on options. Service would focus on commuters. A local tax increase would be needed and would probably come from local sales tax. Respondents said the most important aspect of service is keeping on schedule, with 89 percent saying it was important or very important. Lumped behind that were a schedule that meets commuters’ needs (79%), fast crossing (78%), schedule that makes personal needs (77%) and service guided by a strong business and financial plan (77%). Regarding costs, 69 percent said it was important or very important that more than one-third of operating costs be paid by passengers, 54 percent that taxpayers help with a sales tax of 2 cents per $10 dollar purchase, and 51 percent that fares be $1.50 more each way than current walk-on fares. The largest drawbacks were that it would cost taxpayers too much (31% agree or strongly agree), duplicate existing services (26%), cost riders too much (22%) and not serve enough people (22%). Seventy-eight percent said it would make it easier to get to work or school and 70 percent that it would improve their quality of life. Mason Transit Authority, which opened the nation’s first rural transit-community center a couple months ago, was named the 2015 Rural Community Transportation System of the Year by the Community Transportation Association of America. It’s the first time CTAA has honored a Washington transit agency with one of its national system of the year awards. Mason Transit redesigned an old National Guard armory in downtown Shelton for the transit-community center. Besides catching the bus there, people can take a class, attend a meeting or receive help through the county’s social and human service programs, some of which are now housed in the building. Folks can also shoot hoops or play pickleball in the gym. Besides the transit-community center, MTA was lauded for its after-school actvities bus service, volunteer driver program for seniors, partnerships with tribal governments and its vanpool service, which transports more than 150 workers daily to Puget Sound Naval Shipyard in Bremerton. Transportation Secretary Lynn Peterson and Washington State Ferries director Lynne Griffith last week completed two-week ordinary seaman training. That’s the entry-level deck position for WSF. The women worked side-by-side with a group of new hires on firefighting, abandoning ship, crowd management, vessel navigation and person-overboard rescues. Griffiths’ highlights were personal safety and survival skills training at the Bainbridge Island pool and fire-fighting school at the Kitsap County Readiness Response Center in Bremerton. The pair wanted to experience firsthand what entering the organization and the training involved are like. It’d be neat if they got called in an emergency so a boat could sail. 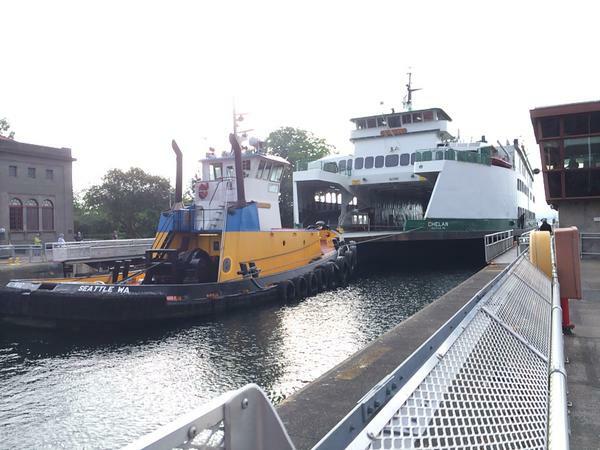 On Monday, the Chelan squeezed through the Ballard locks. The ferry was returning from topside and interior painting at Lake Union Drydock Company. It’s longer than a football field and 80 feet wide. Doesn’t she look perty? The Tacoma is next up for a paint job, and she needs it. Ian Sterling is WSF’s new public information officer. He moved over June 1 from the 520 bridge project, where he was a communications consultant. Before that, he was a field reporter with KOMO Newsradio. Former communications director Marta Coursey has left WSF. She was responsible for not only media relations, but general communications, community outreach, customer service, special events, advertising and marketing. With the exception of customer service and community outreach, Sterling will absorb her responsibilities. Her job is basically being split in two. She and I worked together a long time. I wish her the best.